Trail Running | Fit Girl. Happy Girl. 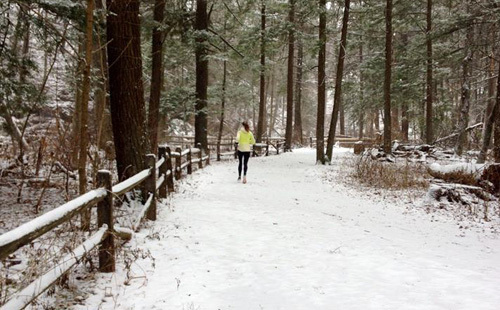 Sometimes, there’s nothing more peaceful than a winter run in the snow. 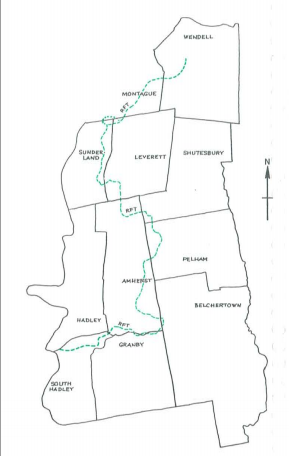 Last weekend my boyfriend and I went up to Jacobsburg State Park, a reservation with miles of trails – technical and easy – just north of the Lehigh Valley. We knew it might be risky because a snowstorm was coming into the region but when we got there, the snow falling lightly around us, we couldn’t wait to head out on the trails. We hadn’t really planned our route too much ahead of time. We looked at a map and thought we’d try out one of the longer routes, even though it went through some of the hunting land. I think we made it about a tenth of a mile onto the trail before spotting our first hunter, who luckily spotted us as well, and told us it would be best for us to run on the non-hunting land. We took his word for it, turned around and headed for the shorter loops. The trail we picked had about a mile of some pretty technical, narrow paths. We took it very slow, due to the difficulty and the snow, but I think I had a smile on my face the entire time. As we kept climbing up the trail, I was careful to keep my eyes on the path in front of me, instead of the pretty snow falling around us. But the second I took my eyes off I felt my legs come out from under me and I was on the ground. I had hit a patch of ice on the downhill but recovered almost gracefully. I had thought I’d be fine running on the trail because I was wearing my new trail shoes but turns out you can’t be saved from snow covered ice sometimes. I brushed off the snow that had covered my legs and we kept running along. Check the hunting laws in the area– We checked before we left, and knew it was the last day of rifle season, but thought we’d be fine to run through anyway. When conditions are a little dicey though, be on the safe side and run in non-hunting areas. Here’s a great article from Runner’s World about how to run safely through hunting season. Wear trail shoes– Although I did wipe out once, I probably would have fallen a lot more had it not been for my trail shoes. I have a pair of Nike Zoom Kigers that I wear not only on trails but on snowy/icy roads. 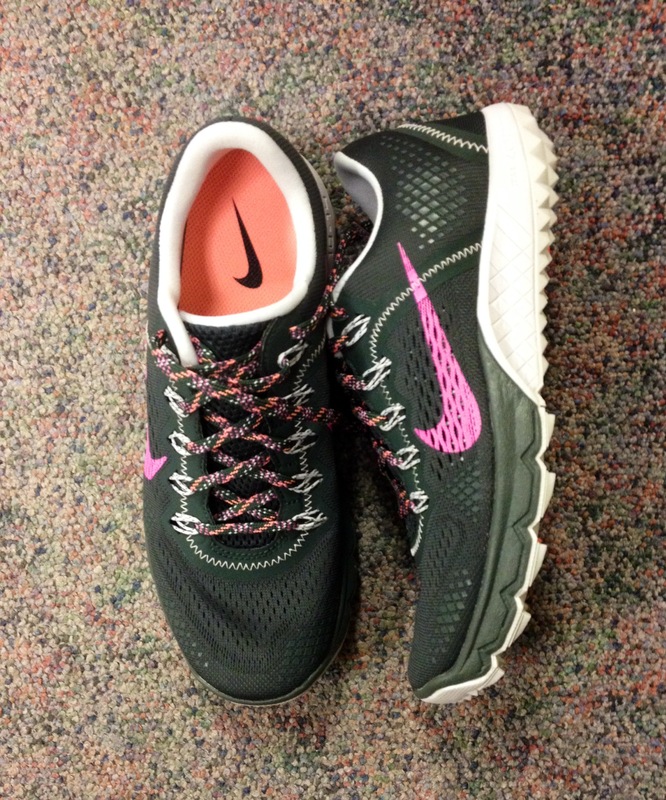 Trail shoes are a great alternative to Yaktrax for winter running. Keep you strides short– Running on trails is different than running on the road. You’ll want to keep your stride shorter to avoid falling. Watch where you’re going– It’s fun to look around but when the trail gets technical keep your eyes on the path you’re running on to avoid any roots or dips you might miss. Don’t worry about pace– On some of the technical parts of the trail we went as slow as 11:00/mile but that’s because we were climbing and dodging trees. Trail running in the snow will also feel a lot harder so focus more on effort than pace. Have fun!– Running through snowy woods is peaceful and exciting. It’s an adventure. You’ll feel like a kid again so enjoy it! Do you have any other tips for running on trails in the winter? Share them below! Kilian Jornet: Back to the source from sebastien montaz-rosset on Vimeo.